The weather continues to be crazy & unusually cold. This has not stopped me attending the 2 football finals at the MCG last weekend & the 2 again this weekend. 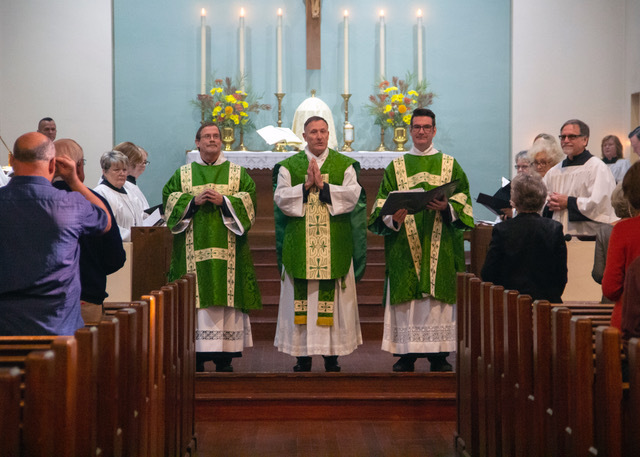 This week was the annual SSC Synod – held here in Melbourne, instead of Sydney. It was good to catch up with my brother priests from all over Australia. The Master General was here from the UK & I discovered that he knew my friend, Joan. It finished with Solemn High Mass last night in All SS. Today I caught up with a former parishioner of All SS, SD, Lynda. We met in the city then caught the tram to St K & had lunch at my place. Incredibly, it is a little over 2 weeks before I go back to SD! This time next week I shall be in the air, on my way to San Diego. Since my last post I have been busy getting ready for the trip as well as enjoying the footy finals. As well as working out what to take, I have had various people to catch up with & 3 sermons to prepare. I always do my sermons before I leave because this is not easy when I am travelling. The next 6 days will be just as busy. I now go to bed early & wake early, so I adjust to US time. This Saturday is the AFL Grand Final. I have a ticket & will be supporting Collingwood – of course! I left Australia for the USA on Wed Oct 3 & had a relaxing 6 days catching up with friends………except for my flights last Sunday. A flight thru LAX was delayed, so I was moved to a flight thru Denver. The connecting flight was also delayed! This was a portent for my flight from SFO to Frankfurt on Tuesday. We sat on the tarmac 3 hours, then went back to the gate & had another 3 hour wait whilst they fixed the problem & got a new crew. I had already changed into my United pj’s & it was quite a sight seeing me in the bus lounge in pj’s, shoes & leather jacket. At least I didn’t have to change when I reboarded the 2nd time! Eventually we arrived in Frankfurt at 5 pm (instead of 10 am). I headed for my usual hotel & was comforted by an upgrade to a lovely suite. However, I had also come down with a cold. After a few rum & cokes in the exec lounge I quickly hit the sack, only to wake at 2 am. I must still be on Aussie time! This morning I went to a pharmacy & got cold capsules & then spent most of the day in my hotel room, except for a walk in the sunshine. I guess it is a matter of waiting for it to end, which may affect plans I have. Tomorrow I catch the train to Bonn, where I will stay 2 nights, then back to Frankfurt for a night before flying to Tallin, Estonia. 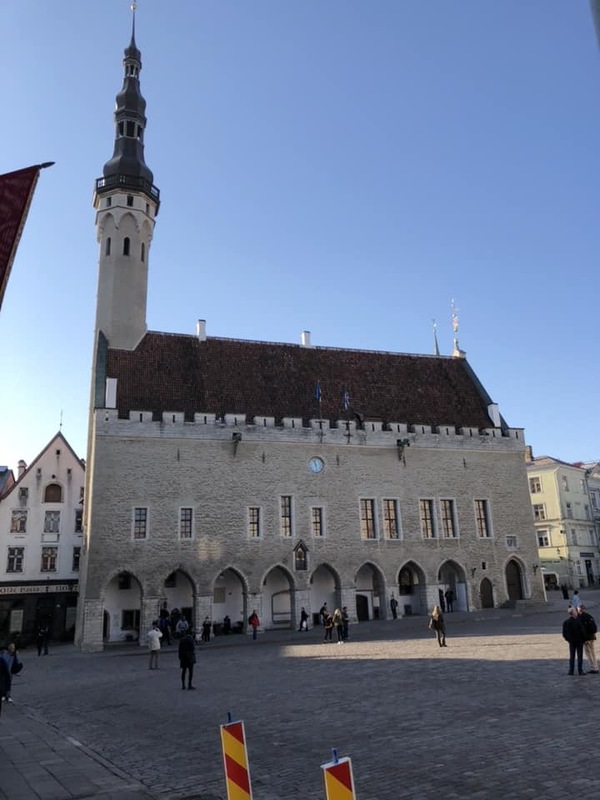 On each trip to Europe I always like to visit a new country & this time it is Estonia. On Saty I caught the train from Bonn to Koblenz. This is a very interesting city which the French have occupied over the centuries. The Rhein & Moselle rivers join here & the point is called Deutsches Eck. It is considered a symbol of German unification, presided over by a huge statue of Kaiser Wilhelm I. Around the statue is a colonnade naming all the states – incl those pre-WW2. Nearby is the impressive St Kantor Basilica. I enjoyed exploring the old town, which has been restored to its mediaeval era. I caught the train back to Bonn, stopping off at Andernach. This is an impressive town with old churches & city walls. 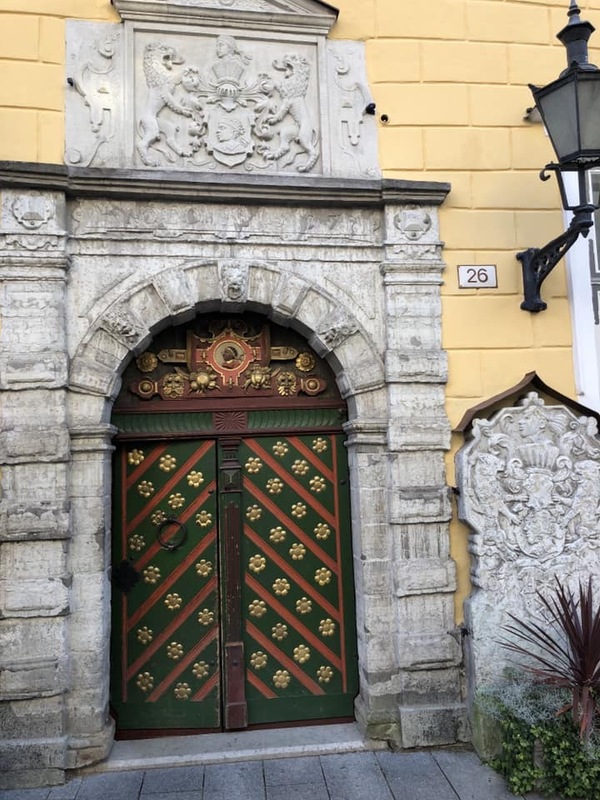 Facing the Rhine is the old city gate & I was fascinated to see plaques higher than my head marking where flood-waters had reached, incl in recent years. Trains to/from Bonn were late or cancelled all w/e because of an accident on Friday. However, I was able to catch another train to Frankfurt yesterday. Today I fly to Tallinn. It has been a nice 3 days in Tallinn. 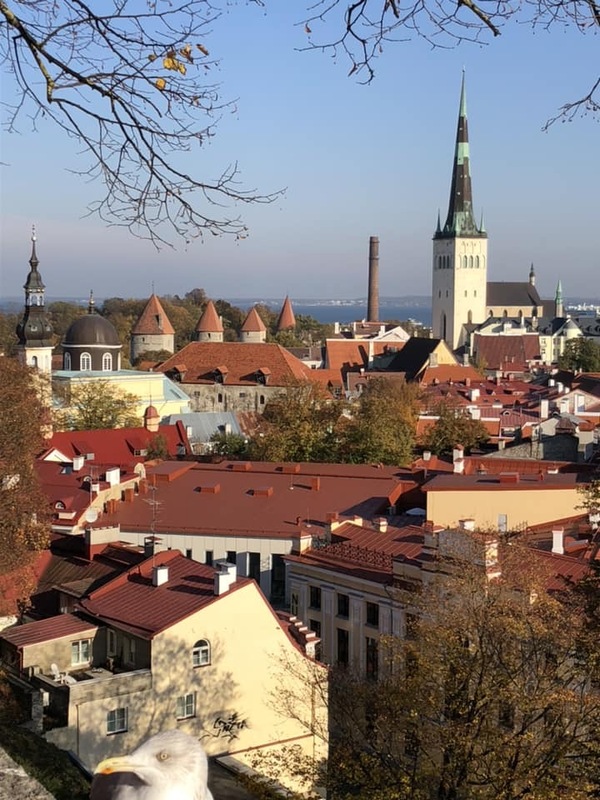 I have always wanted to visit the Baltics & was interested to discover the history & culture of Estonia. On Tuesday I wandered around the old town, which is a fascinating city going back 800 years. Many beautiful buildings & churches, with the old city walls & towers still standing. I finished up at the museum of occupation & freedom. 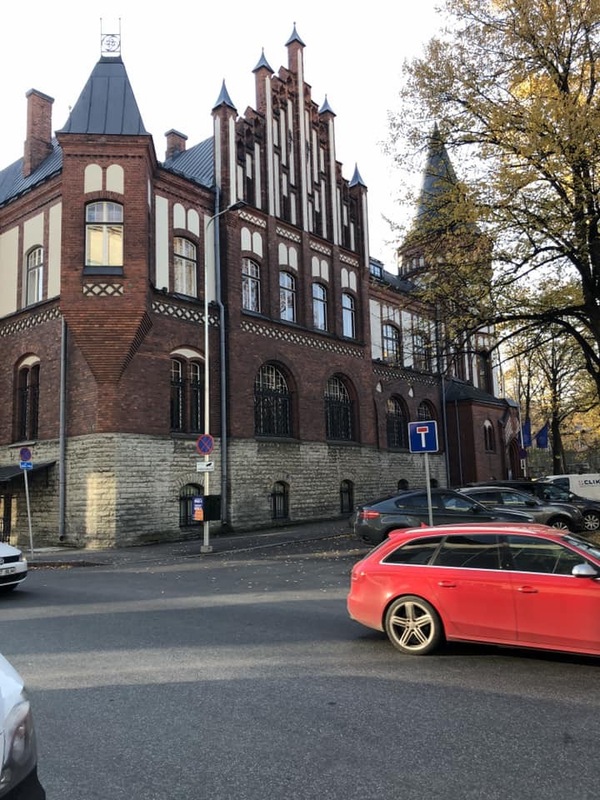 This new museum covers the history of Estonia in recent decades. Established as an independant republic in 1918, it has been occupied by the Russians & Nazis from 1940-1989. It regained its freedom by the Singing Revolution, with no lives lost. 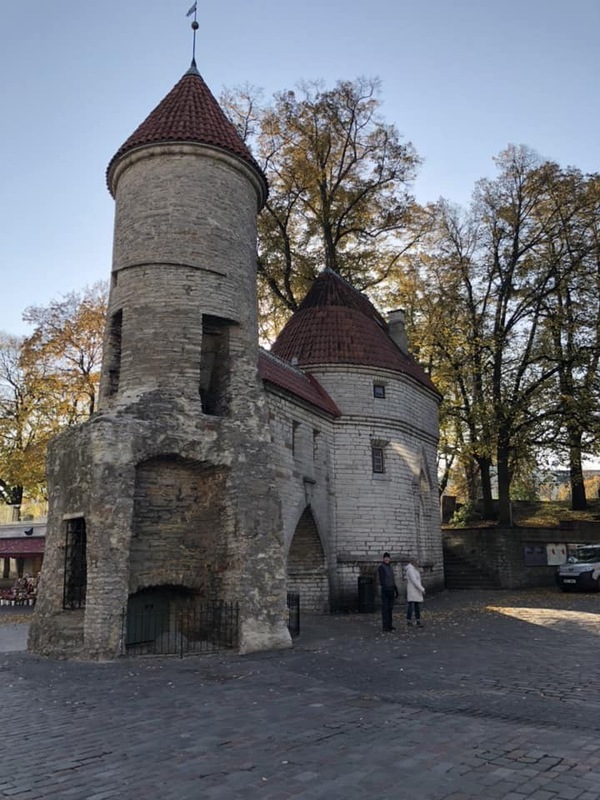 On Wednesday I returned to the old city & spent several hours in the Tallinn City Museum & the Estonian History Museum. Both were excellent modern museums in wonderfully restored historic buildings. Afterwards I walked thru Rotermanni – an industrial area, now revived with modern apartments, hotels, restaurants, etc – like most inner-city renewals around the world. This morning I walked to Kadriorg Park – a large park around a former palace. As usual, I enjoyed walking thru streets & looking at old buildings, as well as observing the locals enjoying the autumn sunshine. Now to Berlin for the weekend. No visit to Germany is complete without a weekend in Berlin. So what did I do? I enjoyed walking around on Friday, observing building works, etc. After breakfast yesterday I walked to the laundromat (25 mins) whch is always an interesting walk early in the morning. One of my friends, noting my familiarity with laundromats, commented that it makes for an interesting itinerary. I replied that you do have clean clothes every 7 days! Then I had to buy new sunglasses – having broken them on arrival at Berlin Hauptbahnhof. So I visited all the malls I am familiar with & finished up buying bew ones back at the 1st one! in the evening I planned to attend the Vigil Mass at St Hedwig’s cathedral………only to discover that it was closed for renovations. I have been to 3 German cities this time – & my favourite churches where I attend Mass are closed for renovation. Good for them, inconvenient for me. So I set out by U-bahn to a church that I attended when I stayed at the Intercontinental, only to discover that it was also undergoing renovation! Fortunately Mass was in the hall behind the church. I am now in Frankfurt, having caught the train from Berlin this morning. Tomorrow I fly to London, for the next stage of my adventures. The weather has been beautiful since I arrived in London on Monday. On Tuesday I caught the train to Bournemouth – another new place for me to visit. After arriving I explored the town, visiting famous St Stephen’s church, which was beautiful, & also St Peter’s, where Mary Shelley is buried. The weather was so good I wore t-shirt & shorts on Wednesday. The sun was out & the sea was so calm. After attending 10 am Mass at St Stephen’s I walked along the sea-front from Bournemouth to Boscombe. Was suprised to find that Bournemouth pier had an admission charge…….thankfully Boscombe pier did not! I walked back along the cliffs. Later I walked along a thin park that follows a little creek. The autumn foliage was lovely. I caught the train back to London yesterday & today go to Walsingham. I am catching the train to Kings Lynn – a new journey. Previously I have caught the train to Norwich, but in July I discovered that they had changed the bus timetable & now has a new stop & long waits. The bus from Kings Lynn is much quicker & the terminal is opposite the station…..unlike in Norwich, which is a 20 min walk uphill! I look forward to a new route & scenery. I had a wonderful week at Walsingham. Because some rostered priests were unwell I said Mon & Tues Mass in the Guild chapel, as well as my own Mass in the Holy House. On other days I concelebrated the Shrine Masses as well as assisting at the evening liturgies. It all finished nicely yesterday with me preaching at the All Souls Day Solemn Requiem Mass in St Mary’s. I caught the train from Norwich back to London yesterday & in the evening met with my namesake, Fr Jack Noble. He is a lovely young priest whom I met at Walsingham several years ago & is now on the staff of the famous St Marylebone parish church. 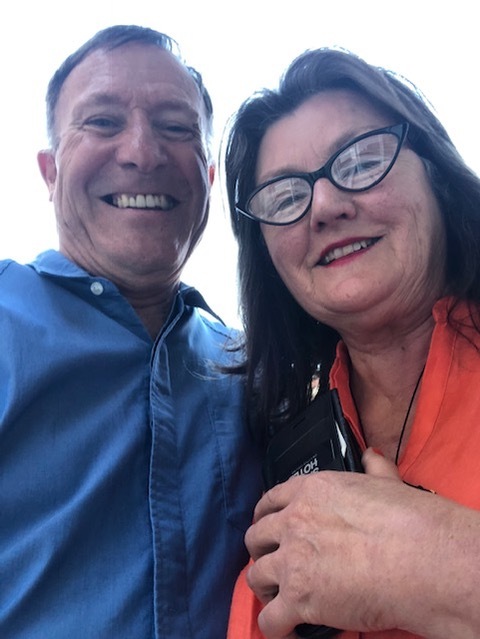 It was great to chat – we discovered that we are not related & he was very interested in my ministry, particularly in Fitzroy. Only 28, he is the same age I was when I entered seminary! Today was the 60th anniversary of my confirmation (in St Peter’s cathedral, Adelaide) & I commemorated this by attending a special Mass to celebrate the canonisation of Archbishop Oscar Romero in St George’s cathedral, Southwark. This was a wonderful occasion, with a packed church, good sermon & wonderful music. The congregation was led in the music by an enthusiastic conductor who made me think I was in El Salvador & not Southwark! Tomorrow I go to High Mass at St Magnus the Martyr. Then I have 4 days in London catching up with friends. I had a busy 4 days in London & weather was good for walking. On Mon & Tues I had lunch with friends incl Phyl, with whom I worked in 1974/75. I also managed to visit the Tate Gallery & see an exhibition of Edward Burne-Jones, the great pre-raphaelite artist. On Wednesday I caught the train to Lingfield to visit old SSC friends at College of St Barnabas, Frs Martin Smith & Michael Shields. On Thursday night I attended the annual solemn requiem mass for the Guild of All Souls at St Stephen’s, Gloucester Rd. In 1974 I briefly lived around the corner & attended St Stephen’s – so did a bit of reminiscing. At the supper afterwards it was good to chat with a number of priests whom I know. On Friday I flew to the US. For the 1st time in over 25 years I was not upgraded. This is becoming a problem with United & it is now impossible to get upgrades on dates that I want. As a result, I shall be switching to another airline next year………a great change in my flying patterns. I have spent the last 3 days getting over jet-lag – waking at 1 am! Tomorrow I fly to DC for 2 days, then back in SD ready for the weekend & my return to All Saints. By the time I got to DC I had developed a cold – probably caught on the flight from London. Never-the-less I had a very interesting day in DC on Wednesday. My plan was to visit the recently opened Museum of the Bible & I was not disappointed. It is a fascinating museum with great displays & exhibits, incl (being America) Elvis Presley’s bible! On Thursday I woke to snow. I was concerned that this would affect my flights back to SD – so got to Reagan airport early. An agent asked me if I would like a 1st class seat on a direct flight to SD from Dulles (an hour the other side of DC). I took it & then travelled by Metro & bus to Dulles. The snow made for a long trip & I got there just as my flight was due to board. A rush thru the airport got me to the gate 5 mins before the door was due to close…….I did enjoy that flight! It was beautiful sunny weather in SD all weekend – but my cold had developed, so I mostly stayed indoors. It was a weekend in which I returned to All SS. Saty night I was celebrant & preacher for the final Mass of a year long festival to celebrate the music of Healy Willan. Fortunately my voice held up for both Mass & sermon. The music by a special choir was wonderful & it was good to be back at my old church. Then this morning I celebrated both Masses & preached. 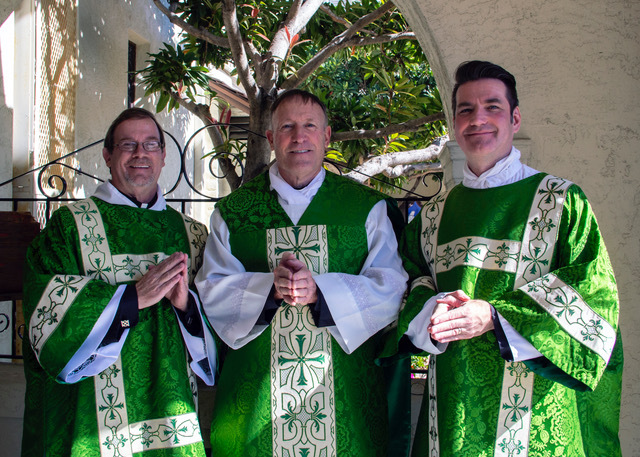 It was like old times with the liturgies, music & parishioners – except the congregations are smaller than in my time. Everyone was pleased to see me & I certainly enjoyed it. Tomorrow I fly back to Melbourne. When I get home it will have been 7 weeks since I left & I will be glad to be back in St K.
I have been back in Australia 10 days now & it has been a busy time. As well as the usual appointments, organising things at home & catching up with friends, Christmas is in less than 3 weeks. 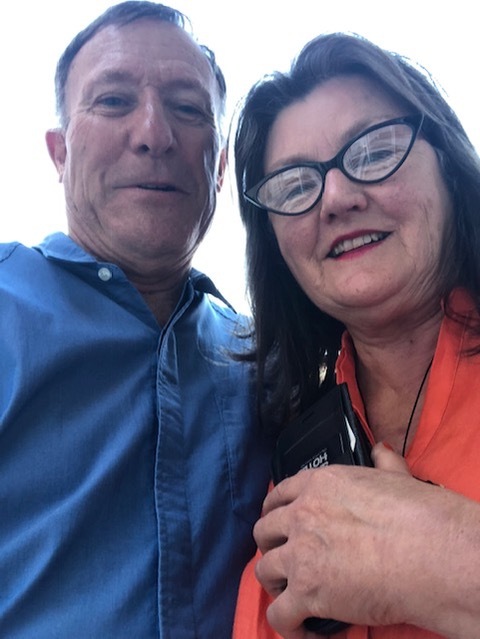 On Saturday 24 I went to a 60th birthday celebration for an old friend from Fitzroy, Fiona, in the historic Astor cinema. It was great to catch up with her godson, whom I had baptised in St Mark’s 25 years ago. I subsequently made contact with his parents & we met for drinks here in St K yesterday a/noon. This week I am off to Launceston for 2 nights, where I am catching up with my old mentor, Fr David Robarts. He was Vicar of Brunswick when I was in Fitzroy & I sought his advice when I was being interviewed for San Diego. We have a lot to catch up on. Before then I must do my Christmas cards! I had a nice time in Launceston. I enjoyed exploring the town (which I had never visited before) including walking along the stunning Cataract Gorge early on Wed morning. In the a/noon I had lunch with Fr Fr David & then he drove me for miles along the Tamar River. Beautiful scenery. I returned to Melb on Thurs & on Monday I flew to Adelaide for 3 days. The main purpose to attend an annual Christmas lunch at Port Adel FC. I also caught up with my cousin & several old friends. Now I am back in St K for Christmas. Have had a busy time, with something on every day & catching up with friends. Quiet lead up to Christmas now & then a busy Christmas Eve & Day. I had a lovely Christmas Day, beginning with Mass at Christ Church (around the corner) celebrated by my good friend, Fr Ken, then lunch with 7 friends at home of Ian & Dale. Since then I have caught up with friends (incl one I hadn’t seen for about 46 years!). Now it is NYE & another year of wonderful travel awaits me. Tomorrow I will attend the New year’s Day Mass & champagne lunch at St James’, E St K. The rest of the week sees meals with friends, incl Julie, whom I haven’t seen since 2005. On Jan 9 I fly back to the US. After 3 weeks based in SD I fly to London & will be there 3 weeks, incl visits to Walsingham & Oxford. After that I have a week in Southern Spain then back to SD. I will be away 9 weeks. My oldest & dearest friend, Julie Finch, came for dinner on the Feast of the Epiphany. We haven’t seen each other since 2005. She now runs a puppet shop in a small Victorian town called Kaniva. We also spent the day together on Monday…….so much to catch up on & much reminiscing.